What we witnessed in Paris was not a Euro Mediterranean summit. The French are not dupe, neither the Europeans; and the occasion provided a good cover. What we witnessed was simply Syria’s reintegration into the International Community. Bashar Assad’s visit to Paris is his first successful international visit since 2004. This visit has to be placed in a context, and that context is not European, it is purely Middle Eastern and challenging after the failure of the regional American project. What happened in Paris is also a European move on the international foreign policy chessboard; a daring maneuver from French President Nicolas Sarkozy who succeeded in convincing his European counterparts that the time was right for distancing themselves from previous alignment on US policy towards the region. This is even more necessary before Washington itself operates a foreign policy shifting leaving Brussels behind. Not to forget that in the United States, it is now “Time to Change” as said by the Democratic presidential contestant Barack Obama. 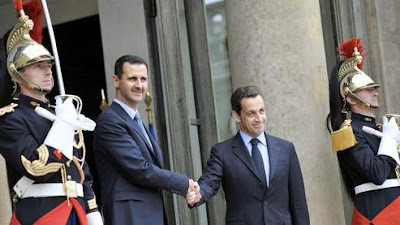 Sarkozy opened wide the gates of Europe and the world to the Syrian President. Paris tried to show that Assad is received only because he responded positively to the French demands: Reducing interference in Lebanon or using positive influence to help in unlocking the Lebanese political deadlock, pushing towards a Hamas – Israel truce through pressure on his Palestinian allies, and finally proving a true will to make peace with Israel and continue visibly what started secretly between the two countries two years ago as the July 2006 war raged on Lebanese soil. This is the tip of the iceberg, but at its base resides a more serious issue: A new balance of power is being formed in the Middle East, there’s a decline (at least temporary) of American influence after decades of direct management of the region while a new Iranian (de facto) regional super power will emerge in case Teheran’s nuclear program is not halted. This new context is highly important to France and Europe, because it’s not only the American “Greater Middle East” that is broken, but because the post cold war American Dream of a Unipolar World that has been crushed. Is it the new dawn of Multipolarity that we’re witnessing? It might be. But it is definitely not the Multipolarity the West was dreaming of. It is one where Europe and the US will have to deal with countries like Iran, Pakistan and Venezuela (…) as regional super powers that have a National Interest to protect, same as Washington, Brussels or Moscow. French diplomacy reveals its conviction that reintegrating Syria in the international community is the only way to take it back from Iran’s arms. But Assad declared this week that following a request from France, Syria would hold talks with Iran to try and resolve the crisis over its nuclear programme! Nicolas Sarkozy knows that this is not how Assad can be stolen from Ali Khamenei, and it is unrealistic, at least for now, to expect Damascus to take a distance from Teheran. It is rather the Iranians who are on the verge of being recognized as a great regional power, by using a Syrian crane made in France. By the way, was Husni Mubarak there? And even if Saudi King Abdullah was with him, Assad would have remained the only star. It is simply not a good time for US allies.